Children with mild asthma: do they benefit from inhaled corticosteroids? In children with mild asthma, who show hardly any abnormalities in pulmonary function, objective measurement of the effect of inhaled corticosteroids is difficult. The short term effect of fluticasone propionate (FP) in these children was evaluated, using both subjective and objective parameters. A total of 68 children (5–10 yrs old) were randomly assigned to either FP 250 µg or placebo twice daily as metered-dose inhaler via spacer during 12 weeks. Symptom scores, use of rescue medication, wheezing, parent global evaluation and pulmonary function tests including forced expiratory volume in one second (FEV1), peak expiratory flow (PEF) and bronchial responsiveness (provocation dose of methacholine causing a 20% fall in FEV1 (PD20)) were evaluated. FP-treated versus placebo-treated children showed significant changes in percentage symptom-free days, use of β2-mimetics, morning and evening PEF, FEV1 % pred and wheezing. No significant improvements were found in parent global evaluation, absolute values of FEV1 nor PD20. These findings show that inhaled corticosteroids are effective in children with mild asthma. This effect can be assessed by both objective and subjective parameters. Early start of inhaled corticosteroids should be considered even when pulmonary function is normal. This study was sponsored by Glaxo Wellcome, Zeist, the Netherlands. Inhaled corticosteroids (ICS) are considered the most effective anti-inflammatory drugs in the treatment of asthma in both children and adults. They reduce symptoms and number of hospitalisations, improve pulmonary function and bronchial hyperresponsiveness (BHR) 1–3 and are more effective than β2-agonists alone 4. International guidelines consider ICS to be indicated in moderate-to-severe asthma but more recent studies promote their use in less symptomatic and younger patients, as this approach might prevent permanent impairment of pulmonary function and irreversible structural airway remodelling 5–7. However, until now international consensus reports do not recommend the use of ICS in subjects who have only mild and infrequent symptoms and who have normal airway calibre most of the time 8. In patients with severe and moderate asthma, pulmonary function test (PFT) parameters can be used as effect parameters to evaluate ICS treatment. However, these parameters are often in the normal range in patients with mild asthma. In children, these normal ranges are wide, and PFT parameters could be decreased in a relative sense and show improvement after proper treatment. There is a lack of proper effect parameters specifically in young children. Symptom scores and the use of short-acting β2-agonists are the most frequently used parameters, but these are sensitive to placebo effects 4. There have only been a few studies concerning the short- 9, 10 or long-term effects 11 of ICS in children with mild asthma. Placebo controlled studies are especially rare 12–14. The aim of this study was to evaluate the effect of short-term treatment with ICS on both subjective and objective disease parameters in 5–10-yr-old children with mild asthma. Children, 5–10 yrs of age, with a doctor's diagnosis of asthma 15 were recruited. Patients were excluded if they had used systemic corticosteroids in the last 2 months prior to the study, ICS >100 µg budesonide (BUD) or beclomethasone dipropionate (BDP) daily in the last 4 weeks, salbutamol >1,600 µg daily during >30% of days of the last year prior to the study, if they had been hospitalised for asthma in the last 2 weeks or if they had other respiratory disorders, systemic disease or anatomical abnormalities. Written informed consent was obtained from parents of all participating patients. Power analysis was performed with percentage of days without asthma symptoms, as calculated from the diary cards, as the primary outcome variable. For the power calculation the change from baseline of this variable was used. The sd of this change was set at 30 per cent points. The clinically relevant difference of change from baseline between the placebo group and the fluticasone propionate (FP) group was set at 20 per cent points. To detect this difference with 80% power, 35 patients per treatment group were needed, given a test size of 5% (two sided). This was a multicentre, double-blind, placebo-controlled, randomised, parallel-group study. Patients were recruited from one paediatric pulmonology outpatient clinic of a university hospital, one asthma centre and seven general hospitals. The study was approved by all local ethics committees. Subjects were randomly assigned to use either two dosages of FP 125 µg or two dosages of placebo twice daily from a metered-dose inhaler via a plastic spacer device (Volumatic®; Glaxo Wellcome, Zeist, the Netherlands) during 12 weeks. During the whole study, salbutamol 200 µg via spacer was allowed as rescue medication. Exacerbation of asthma, defined as an increase in asthma symptoms not controlled with salbutamol up to 8 times 2 puffs daily, was treated at the discretion of the investigator with prednisolone 1–2 mg·kg−1 daily during 3 days. At visit 1, at the beginning of a 2 week run-in period, the study was explained, medical history, concurrent medication and demography were recorded, together with the presence or absence of wheezing, and PFTs were performed. Parents and children were instructed to use the peak expiratory flow (PEF) meter at home, to fill out the daily record card (DRC) and to use rescue medication if necessary. After comprehensive instructions they were able to inhale medication properly via a spacer device and perform PEF measurements. Only patients using BDP or BUD ≤100 µg daily, prior to the study, were instructed to continue this medication throughout the study in addition to the study medication. At visit 2, after 14±3 days, only patients with symptoms on at least 50% of days during the run-in period were randomised, excluding patients who used rescue medication ≥8 puffs·day−1 on ≥4 days during the run-in period. Further visits were scheduled 3, 11 and 12 weeks later (visits 3, 4 and 5, respectively). At all visits, baseline PFTs were performed. At visit 2 and 4, bronchoprovocation tests were performed after baseline PFTs. At every visit, adverse events, concurrent medication, asthma exacerbations and compliance with the study were checked. Throughout the study, the parents filled out a DRC for presence of asthmatic symptoms, use of rescue medication, both morning and evening PEF, adverse events and concurrent medication. PEF measurements were performed using the Personal Best PEF meter (Healthscan, Cedar Grove, NJ, USA). The highest value of a minimum of three acceptable measurements was recorded. Maximal expiratory flow volume measurements were performed, which conformed with the European Coal and Steel Community recommendations 16 using a pneumotachometer system (Masterscreen Pneumo; Erich Jaeger, Würzburg, Germany). The best of three technically good measurements was recorded. The following parameters were recorded: forced expiratory volume in one second (FEV1) and FEV1 as percentage of the predicted value (FEV1 % pred) 17. No bronchodilator was used for <8 h before PFT. Bronchial responsiveness was measured using methacholine bromide provocation according to a standardised protocol 18. At all visits, wheezing, defined as the presence of a prolonged audible expiratory phase during auscultation and/or use of accessory respiratory muscles, was judged on physical examination by the same paediatrician. During the last visit the parents were asked to rate the effect of study medication on symptoms on a scale from 1 (strongly improved) to 4 (worsened). The symptoms and use of rescue medication were summarised daily as symptom-free (yes/no) and rescue medication-free (yes/no). Within each patient, these daily scores constituted a series of repeated 0/1 data that were analysed using a generalised linear model for repeated measurements with model fitting based on Generalised Estimating Equations 19. Because of the binary (0/1) outcome scores, the binomial distribution was assumed with the dependency of the probability parameter on the explanatory variables modelled through a logistic function. The day-to-day correlation structure of the outcome scores was assumed to be first order autoregressive (“AR(1)”). In the logistic model, the treatment effect was represented by an odds ratio (OR) (95% confidence interval (CI)) of active relative to placebo treatment. Adjustment was made for the percentage of symptom-free (or rescue medication-free) days during the baseline period as continuous covariant and for time under treatment defined by four consecutive periods of 3 weeks as a within patient factor. The point of dividing the treatment period into four equal periods of 3 weeks was to find a general categorical treatment by time interaction without having to assume a priori a linear trend in this treatment by time interaction. The interaction between treatment and time was tested. If this interaction turned out to be significant, with p<0.10, then the treatment effect was presented per period. Otherwise, one overall treatment effect (assumed to be constant in time) was presented. Morning and evening PEF values, measured at home, were used to calculate 3-week averages per patient for each of the four 3-week periods, for morning and evening separately. These averages constituted the four repeated measurements of the outcome variable, which were analysed using mixed model analysis of variance (ANOVA). The independent variables in this analysis were treatment group (a 2-level between-patient factor) and period (a 4-level within-patient factor); the average PEF per patient over the baseline period was included in the model as a continuous covariant. An AR(1) correlation structure between the repeated measures was assumed. The treatment by period interaction was tested and dealt with as described for DRC data. 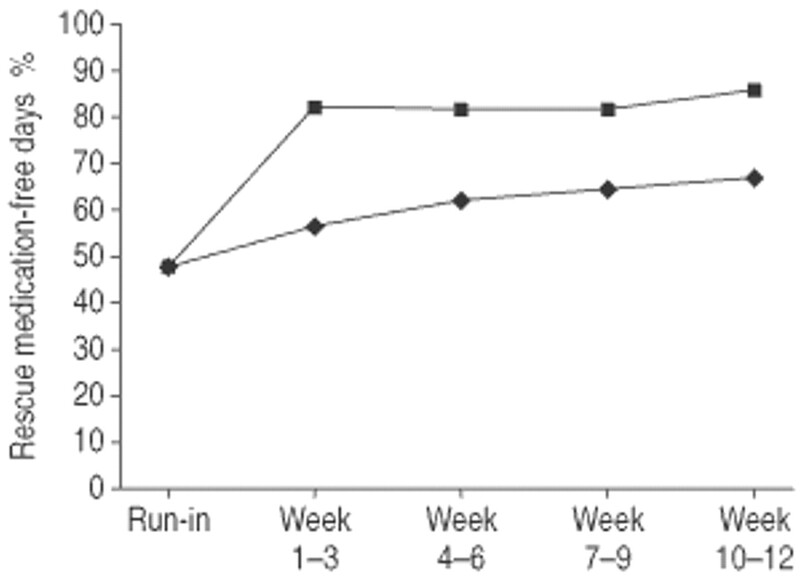 Repeated PFTs were performed at baseline and three times during the 12-week treatment period. In a mixed model ANOVA, the values of each PFT parameter during treatment were compared between the two treatment groups, adjusted for period (3 levels) and baseline measurement of the outcome variable at hand. The treatment by period interaction was also tested and dealt with as described for DRC data. No structure was assumed for the (co)variance matrix of the residuals. The provocation dose of methacholine causing a 20% decrease of FEV1 (PD20) was analysed as doubling doses after ln2-transformation using nonparametric tests, because values >8 were coded as 8. The PD20 at visit 4 was compared between the two treatment groups, using the Mann-Whitney U-test. Within-group changes from baseline were tested using the paired Wilcoxon test. PD20 was also analysed after dichotomisation in hyperresponsive, yes (natural logarithm of the PD20 (ln2PD20) <8) versus no. The measurement at visit 4 was compared between the two treatment groups using logistic regression analysis, with the baseline score as covariant. The treatment effect could then be expressed as an OR, adjusted for baseline. There were four repeated physical examinations during the 12-week treatment period: visit 2–5. The absence or presence of wheezing was analysed using the same generalised linear model as described for DRC parameters. The between-visit correlation structure of the responses was left unstructured. The treatment effect was represented by an OR (95% CI) of active versus placebo. The parent global evaluation for both treatment arms was compared using the Chi-squared trend test. A total of 88 patients entered the run-in period. From them, 20 patients were withdrawn before randomisation, due to insufficient asthmatic symptoms (n=14), too frequent use of rescue medication (n=1), poor compliance (n=2), an asthma exacerbation (n=1), adverse effect of salbutamol (n=1) and withdrawal of parental informed consent on second thoughts (n=1) during the run-in period. A total of 68 patients were randomised and completed the study. Patient baseline characteristics are shown in table 1⇓. There were no significant differences in baseline characteristics between withdrawn patients and included patients or between patients in both treatment arms. During the run-in period, mean symptom scores and clinical scoring indices were low and mean pulmonary function parameters were within normal ranges. Prior to the study, six patients received maintenance treatment with budesonide (four) or beclomethasone ≤100 µg daily (two). These ICS were continued by one (3%) and five (15%) of FP- and placebo-treated patients, respectively. There were no significant differences between both treatment arms in number of asthma exacerbations, adverse events, concurrent medication and compliance with the study. The mean percentage symptom-free days increased from 14% during the run-in period to 25–49% in the placebo versus 42–66% in the FP-treated group over the four consecutive periods (fig. 1⇓). The estimated OR for FP versus placebo was 1.93 (95% CI 1.05–3.54; p=0.04). There was no suspicion that the OR changed in time (p=0.89). 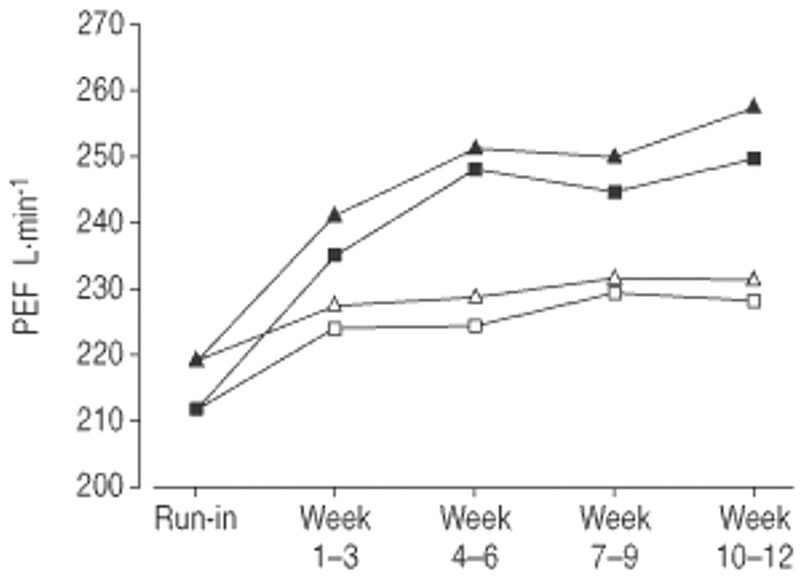 Changes in symptom-free days adjusted for baseline during 12 weeks of treatment with study medication. ♦: placebo; ▪: fluticasone propionate. The mean percentage rescue medication-free days increased from 48% to 57–67% in the placebo versus 83–86% in the FP-treated group over the four periods (fig. 2⇓). The estimated OR of FP versus placebo was 3.08 (95% CI 1.49–6.36; p<0.01) without suspicion of changes of OR in time (p=0.76). Changes in rescue medication-free days adjusted for baseline during 12 weeks of treatment with study medication. ♦: placebo; ▪: fluticasone propionate. The mean difference in PEF between the FP- and placebo-treated group varied significantly over the periods (p<0.10) both for morning (p=0.01) and evening (p=0.09) values. 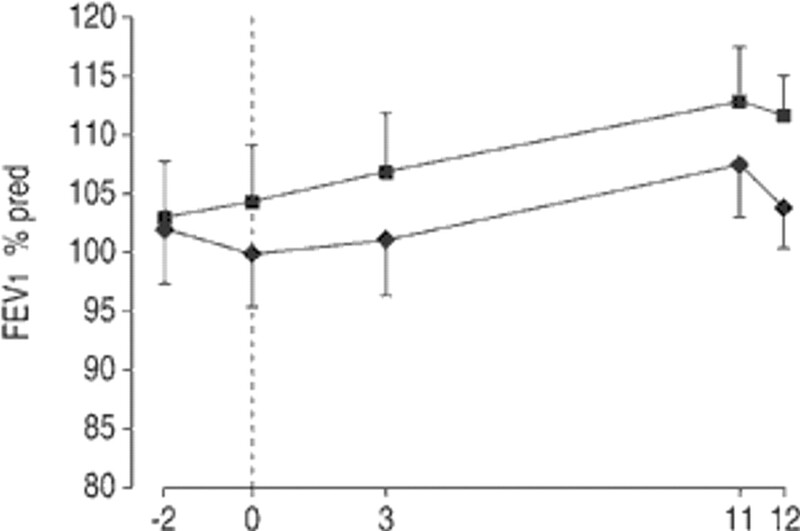 Mean PEF was higher in the FP-treated than in the placebo-treated group (fig. 3⇓). For morning PEF the mean differences between both groups was 16 L·min−1 (p<0.01), varying from 11 to 24 L·min−1, for evening PEF this was 19 L·min−1 (p<0.01), varying from 14 to 26 L·min−1. For all periods these effects were significant. Changes in morning and evening peak expiratory flow (PEF) values adjusted for baseline during 12 weeks of treatment with study medication. □: morning PEF placebo; ▵: evening PEF placebo; ▪: morning PEF fluticasone propionate; ▴: evening PEF fluticasone propionate. Compared to placebo-treated children, absolute values of FEV1 showed no significant change (+0.06 L; p=0.08), but there was a small but significant increase in FEV1 % pred in the FP-treated children (+4.6%; p=0.04) (fig. 4⇓). 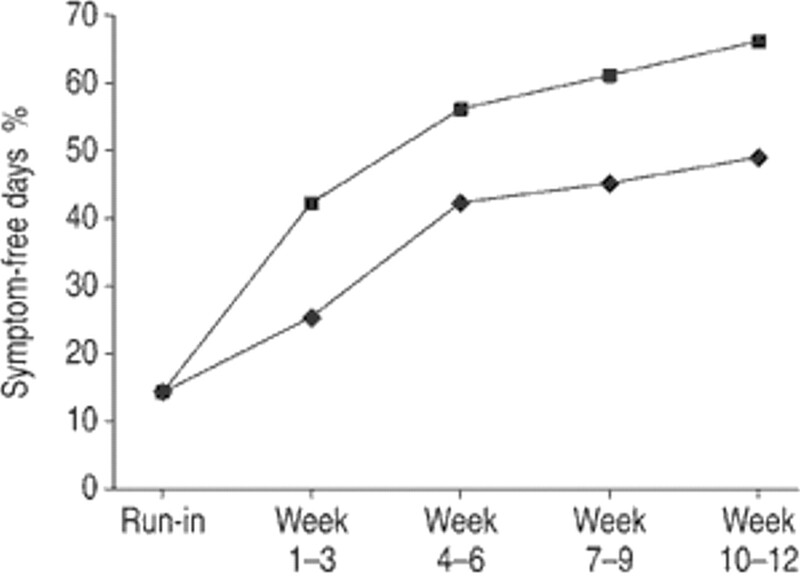 Changes in forced expiratory volume in one second (FEV1) % pred during 12 weeks of treatment with study medication. - - -: zero line indicates initiation of treatment, time before indicates run-in period. ♦: placebo; ▪: fluticasone propionate (FP). FP versus placebo: +4.6%, p=0.044. After 11 weeks of treatment ln2PD20 was significantly higher in the FP-treated group compared to placebo (7.14 versus 5.96; p=0.04) but there was no significant difference between the two groups in change of ln2PD20 from baseline to week 11 (p=0.11). At the end of treatment, 32 out of 35 FP-treated (91%) and 26 out of 33 (79%) placebo-treated patients showed normal wheezing scores. This difference was not statistically significant (p=0.11), but significant improvement in wheezing score was seen in the FP versus placebo group at visit 2 and 4 (p=0.003 and p=0.008, respectively), but not at other visits. The OR for FP versus placebo for wheezing was 0.38 (95% CI 0.15–0.96; p=0.04) for the whole study period. A total of 71% of parents of FP-treated versus 52% of placebo-treated children reported an improvement in symptoms. Increasing symptoms were experienced by 15% of parents of placebo versus 0% of FP-treated children. This difference was not significant (p=0.062). In this study the effects of ICS in 5–10-yr-old children with mild asthma was compared to placebo, using both subjective and objective parameters. Treatment with FP significantly improved percentage symptom-free days, percentage rescue medication-free days, both morning and evening PEF values, FEV1 % pred and wheezing score. No significant improvements were found for parent global evaluation, absolute values of FEV1 and PD20. In mildly symptomatic adult patients there is evidence of airway inflammation, improving after treatment with ICS 20. In adults, improvement of night-time symptoms, rescue-medication use and morning PEF have also been recorded 21. Until now only a few studies have evaluated the effect of ICS in children with mild asthma 9–13. Most of these studies were performed in older children and using different effect parameters. Partially contradictory results were found. Effects were found on symptom scores. Some found improvements in PEF values 9, 10, others found no improvement or improvements in evening and not morning PEF 12, 13. Hoekx et al. 10 found a significant improvement in PEF values in older children after 8 weeks of treatment with both FP 400 µg and BUD 400 µg, despite the fact that at the beginning of the study the lung function was near normal. However, this study was not placebo controlled and patients were not steroid naive. An improvement in bronchial responsiveness in children with mild asthma has been described previously 12, 13. In contrast to the present study, a significant effect on FEV1 was not always found 9, 10, 12, 13. The present study provides further evidence for a positive effect of ICS in children with mild asthma. The conjecture that asthma in the patients studied was mild is supported by the fact that at an age of ≥5 yrs most of the patients were not treated with anti-inflammatory agents, on average had mild symptoms, pulmonary function and bronchial responsiveness were normal and salbutamol use was low. Nevertheless improvements in both subjective and objective effect parameters were found. Changes in symptom scores and use of rescue medication were most prominent, but significant changes were also found in PFT results. No significant changes in BHR were recorded. The use of symptom scores and use of rescue medication is easy and can be used even in young children who cannot perform lung function tests. The participating patients were selected on the basis of symptoms and the use of β2-agonists, so that bias because of regression to the mean may have caused part of the improvements in both the treatment and placebo groups. Although baseline FEV1 % pred values were high (≥100% pred) and reversibility was poor in contrast to other studies 12, 13, a small though significant improvement in FEV1 % pred was recorded after only 12 weeks of treatment. The only comparable study was performed by Jonasson et al. 12. In a later study, they also found a significant dose-response effect on FEV1 in a 24-month follow-up study with ICS in 122 mildly asthmatic children 14. Recently, in a large placebo-controlled, long-term study, the Childhood Asthma Management Programme Research Group found significant improvements in prebronchodilator FEV1 % pred and FEV1/forced vital capacity (%) in mild-to-moderately symptomatic 5–12-yr-old children after 4–6 yrs treatment with BUD. However, the improvement of FEV1 % pred was attributed to a smaller stature in the BUD-treated group. Airway responsiveness and symptom control also improved 11. The present study shows that in children with mild asthma, pulmonary function can improve after only short-term treatment. Improvements are only small but they are significant, especially when normal baseline parameters are considered. Normal lung function in children with symptoms of asthma does not rule out airway obstruction improving after proper treatment. As in earlier reports, this study demonstrates that after the start of ICS treatment the improvement in PEF and symptoms often precede the improvement of other lung function parameters 4. In the present relatively short treatment study, it could be expected that these parameters would change most prominently. The improvement in PFT parameters gradually increased throughout the study (figs 3 and 4⇑⇑). Earlier studies in children with normal lung function may have been too short or the ICS dose too low to observe these effects. In the present study no changes in BHR were found in either treatment arms. The finding of BHR in this study population suggests that airway inflammation is present even in mild asthma. Although this finding supports treatment with ICS, no significant benefit of treatment on BHR could be established in the present study. As mentioned previously, this may be due to the relatively short treatment period and is in agreement with the existing concept that improvement of BHR is a relatively late response after institution of ICS and that improvement can continue over many years. Van Essen Zandvliet et al. 4 showed that reduction in BHR increases gradually and only stabilises after 20 months of treatment with ICS. The value of long-term treatment and the possible preventive effects on remodelling still need to be established. Normally, lower doses of ICS are used for treatment of children with moderate (or mild) asthma. However larger doses are sometimes used by paediatricians and paediatric pulmonologists, especially in a step-down therapy. With the present dose, serious adverse reactions in this relatively short study were not expected, while optimal treatment effects could be expected, compared to placebo. In conclusion, in 5–10-yr-old children with mild asthma, treatment with fluticasone propionate results in improvement in symptoms, salbutamol use, peak expiratory flow and forced expiratory volume in one second % predicted. These findings suggest that normal lung function does not rule out airway obstruction, and even in young patients with mild asthma early start of inhaled corticosteroid maintenance might be considered. In view of these results and the emerging knowledge of long-term airway remodelling in patients with chronic asthma, treatment of mildly asthmatic patients with inhaled corticosteroids is recommended. Dekhuijzen PNR, Bootsma GP, Herwaarden CLA. Clinical efficacy and side effects of inhalation corticosteroids in asthma. Ned Tijdschr Geneeskd 1994;138:1408–1413. Barnes PJ. Inhaled glucocorticoids for asthma. N Engl J Med 1997;332:868–875. Donahue JG, Weiss ST, Livingston JM, Goetsch MA, Grieneder DK, Platt R. Inhaled steroids and the risk of hospitalisation for asthma. JAMA 1997;277:887–891. Van Essen-Zandvliet EEM, Hughes MD, Waalkens HJ, Duiverman EJ, Pocock SJ, Kerrebijn KF. Effects of 22 months of treatment with inhaled corticosteroids and /or beta-2-agonists on lung function, airway responsiveness and symptoms in children with asthma. The Dutch Chronic Non-specific Lung Disease Study Group. Am Rev Respir Dis 1992;146:547–554. Haahtela T, Jarvinen M, Kava T. Effects of reducing or discontinuing inhaled budesonide in patients with mild asthma. N Engl J Med 1994;337:700–705. Agertoft L, Pedersen S. Effects of long-term treatment with an inhaled corticosteroid on growth and pulmonary function in asthmatic children. Respir Med 1994;88:373–381. National Asthma Education and Prevention Program: expert panel report 2. Guidelines for the diagnosis and management of asthmaBethesda, MD, DMS publication, 1995. O'Byrne PM. Inhaled corticosteroid therapy in newly detected mild asthma. Drugs 1999;58:Suppl. 4, 17–24. Gustafsson P, Tsanakas J, Gold M, Primhak R, Radford M, Gillie E. Comparison of the efficacy and safety of inhaled fluticasone propionate 200 micrograms/day with inhaled beclomethasone dipropionate 400 micrograms/day in mild and moderate asthma. Arch Dis Child 1993;69:206–211. Hoekx JC, Hedlin G, Pedersen W, Sorva R, Hollingworth K, Efthimiou J. Fluticasone propionate compared with budesonide: a double-blind trial in asthmatic children using powder devices at a dosage of 400 microg×day(−1). Eur Respir J 1996;9:2263–2272. Jonasson G, Carlsen KH, Blomqvist P. Clinical efficacy of low-dose inhaled budesonide once or twice daily in children with mild asthma not previously treated with steroids. Eur Respir J 1998;12:1099–1104. Waalkens HJ, Gerritsen J, Koeter GH, Krouwels FH, van Aalderen WMC, Knol K. Budesonide and terbutaline or terbutaline alone in children with mild asthma: effects on bronchial responsiveness and diurnal variation in peak flow. Thorax 1991;46:499–503. Jonasson G, Carlsen KH, Jonasson C, Mowinckel P. Low-dose inhaled budesonide once or twice daily for 27 months in children with mild asthma. Allergy 2000;55:740–748. Guidelines in the management of asthma. Thorax 1993;48:S1–S24. Quanjer PH. Standardised lung function testing. Bull Europ Physiopath Respir 1983;19:Suppl. 5. Zapletal A, Samanek M, Paul T.. Lung function in children and adolescents. Methods, reference valuesIn: Zapletal A, ed. Progress in Respiration ResearchBasel, Switzerland, Karger, 1987; 22: pp. 114–218. Wilts M, Hop WCL, Van der Heyden GHC, Kerrebijn KF, De Jongste J. Measurements of bronchial responsiveness in young children: comparisons of transcutaneous oxygen tension and functional residual capacity during induced bronchoconstriction and dilatation. Pediatr Pulmonol 1992;12:181–185. Liang KY, Zegers SL. Longitudinal data analysis using generalised linear models. Biometrica 1986;73:13–22. Lorentzson S, Boe J, Eriksson G, Persson G. Use of inhaled corticosteroids in patients with mild asthma. Thorax 1990;45:733–735. You are going to email the following Children with mild asthma: do they benefit from inhaled corticosteroids?